This monitor will run when the engine is started at an engine coolant temperature of -10 to 50°C (14 to 122°F). The DTC is stored after the engine idles for 13 seconds (2 trip detection logic). The DTC is designed to monitor the idle air control at cold start. When the engine is started at an engine coolant temperature of below 50°C (122°F), the ECM measures the accumulated mass air flow during engine idling. If the accumulated mass air flow does not reach the specified level within 10 seconds, the ECM interprets this as a malfunction. The MIL is illuminated and a DTC is stored when the malfunction is detected in consecutive driving cycles (2 trip detection logic). The electronic throttle control system controls the idle speed. The electronic throttle control system operates the throttle actuator to open and close the throttle valve, and adjusts the intake air amount to achieve the target idle speed. The idle speed control learned values are cleared by performing a learned value reset. Idle speed control learning needs to be performed before this DTC can be stored. Insufficient mass air flow after a cold start (2 trip detection logic). 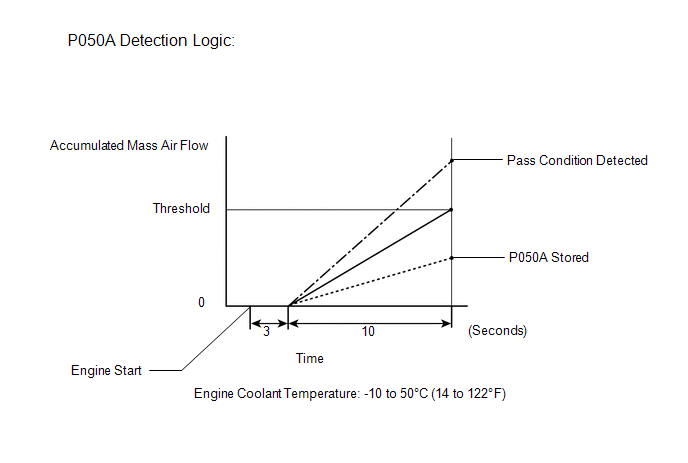 Check that "Coolant Temp" in the Data List are within the range of -10 to 50°C (14 to 122°F). Start the engine and warm it up until the coolant temperature is the same as the coolant temperature in the freeze frame data. Idle the engine for 1 minute or more. If the judgment result shows INCOMPLETE or N/A, idle the engine for 3 minutes, let the engine cool down, and then perform steps [A] through [B]. (d) Enter the following the menus: Powertrain / Engine / Trouble Codes. If any DTCs other than P050A are output, troubleshoot those DTCs first. Calculate the total fuel trim values to check the characteristic deviation of the mass air flow meter. (d) Enter the following menus: Powertrain / Engine / Data List / Short FT #1 and Long FT #1. (f) Add together the Short FT #1 and FT #1 values to obtain the total fuel trim. Total of Short FT #1 and FT #1 values is between -20% and 20%. (a) Check for deposits around the throttle valve and check the throttle valve condition. No deposits around the throttle valve and throttle valve moves smoothly. (a) Repair or replace the throttle body assembly (See page ). Perform "Inspection After Repair" after repairing or replacing the throttle body (See page ). No leakage from the intake system. (a) Visually check that the air cleaner filter element is not excessively contaminated with dirt or oil. Air cleaner filter element is not excessively contaminated with dirt or oil. (a) Operate the VVT system through the Active test, and check if the VVT system is operating normally. (1) Perform the Active Test, referring to DTC P0011 Inspection Procedure (VVT system for intake camshaft) (See page ). (2) Perform the Active Test, referring to DTC P0014 Inspection Procedure (VVT system for exhaust camshaft) (See page ). (a) Repair or replace the PCV hose. (a) Repair or replace the intake system. (a) Replace the air cleaner filter element sub-assembly. (a) Check and repair the VVT system. Refer to DTC P0011 Inspection Procedure for intake camshaft (See page ). Refer to DTC P0014 Inspection Procedure for exhaust camshaft (See page ). In this operation, the engine must be cold (the same level as the engine coolant temperature recorded in the freeze frame data). (h) Check that the engine coolant temperature is between -10 and 50°C (14 and 122°F). (i) Start the engine and warm it up. (j) Drive the vehicle in accordance with the driving pattern described in the Confirmation Driving Pattern. (k) Enter the following menus: Powertrain / Engine / Utility / All Readiness. (l) Input the DTC: P050A. (m) Check the DTC judgment result. In this operation, the engine must be cold (approximately the same as the engine coolant temperature recorded in the freeze frame data). (j) Drive the vehicle in accordance with the driving pattern described in Confirmation Driving Pattern. If the result of the inspection performed in step 9 indicated no problem, proceed to the next step without replacing the mass air flow meter.